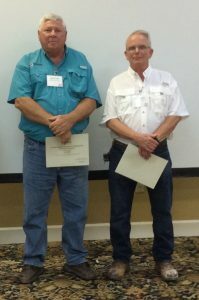 Pellicano is proud to annouce that James Fallin & Jerry Trull received the Ron Amerson Supervisors’ Safety Award presented by the AGC of Georgia. AGC Georgia’s Ron Amerson Supervisors’ Safety Award program is designed to recognize member firms’ field supervisors who achieve safety excellence based on no lost-time accidents. This annual program spotlights general and specialty contractors’ field supervisors for their outstanding safety performance and dedication to jobsite safety. The man-hours include supervised time for employees on the member company’s payroll and not subcontractors. Superintendents who meet the requirements earn a Certificate of Commendation for Safety Excellence presented at award ceremonies around the state either close to their home office or current jobsite.